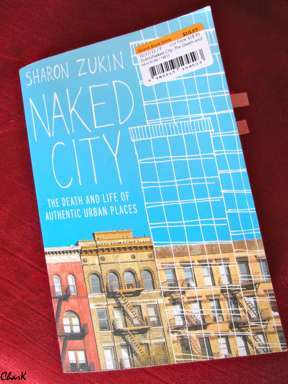 I picked up a book in New York called Naked City: The Death and Life of Authentic Urban Places by sociologist Sharon Zukin. The title is a take-off of Jane Jacobs’ The Death and Life of Great American Cities, which I’ve mentioned a few times already on this blog. 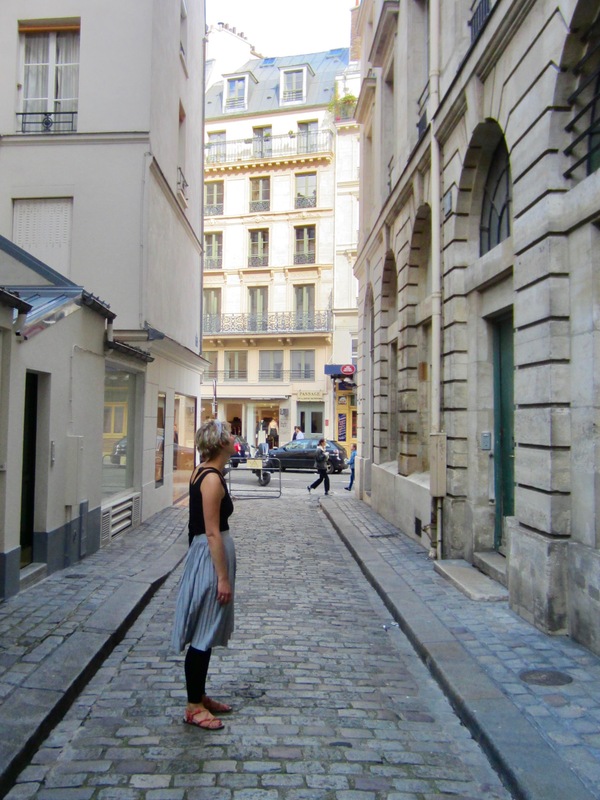 Zukin analyzes the latest selling feature of urban spaces in today’s city – authenticity. We visit certain places in the name of authenticity. Authenticity has become an experience more than a characteristic, and can be said about objects and places as much as about people. Reluctantly, I admit that this describes my attraction to these places. I say reluctantly because who wants to confess to being part of the phenomenon that helps destroys authenticity by consuming it? 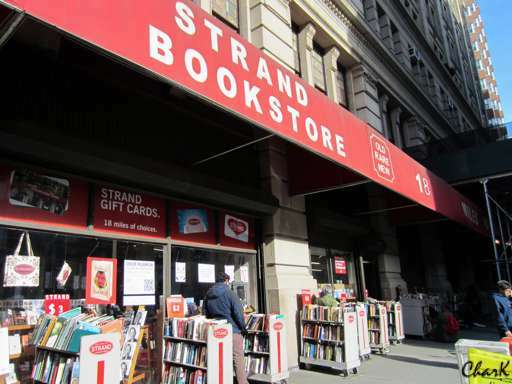 Yet the chance to inhale or soak up an authentic experience of local culture explains my visit to these places, and perhaps even my desire to buy a “local” or “authentic” book about New York while in New York, and not just from anywhere in New York, but from The Strand – an independent bookstore known for its rare and out-of print books located in the East Village, of course. That was news to me, and something I wouldn’t be able to guess just by looking at the park, which has the appearance of a very public space. But that’s exactly the illusion. Zukin states that “the vitality of Union Square is really a sign of the city government’s defeat by the public’s expectations.” Why a defeat? Because this so-called “public” space is actually privately owned. What’s the advantage of private ownership? Safety is a big reason – privately hired security guards and cleaners keep the park open and accessible to multiple users – but not all users. Zukin notes that control strategies in the park exclude certain groups, usually homeless people, street vendors, or street artists who have no other place to go. This relates to my previous post “Whose Space is it Anyway?” about my experience in Victoria a few months ago. In the name of a clean, safe space for the public, the public gains a space that paradoxically isn’t so public. In the name of safe space. 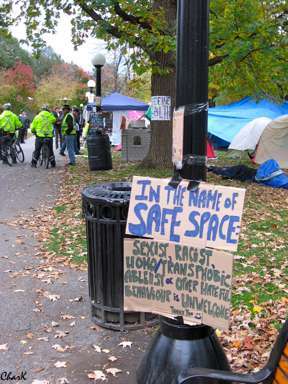 Talking about “safe space” reminds me of a sign that I photographed at the entrance to the Occupy Ottawa movement that was setting up camp around mid-October. The sign declares that this park is a safe space based on inclusion, diversity, and lack of discrimination. Being a former literature student, I love thinking about words and the implications they have. 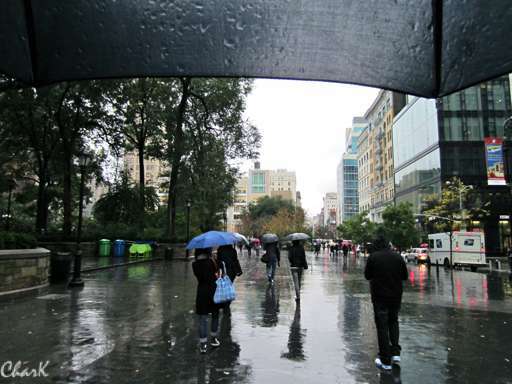 Going back to Zukin’s book, this park though – or any park for that matter – has the potential to become “safe” in the way that Zukin is using when she talks about why people generally like the safe and privately-managed space of Union Square Park. When she says the public gains the use of a clean, safe space (while simultaneously losing control over it) – this same “safe” does not imply diversity, but rather, the exclusion of diversity. Safe in this context means safety from the threat of danger and difference, from risky interactions with the “other,” from people sleeping on park benches and from walls covered in graffiti, which lower property values and detract from businesses in the area. That’s a comparison I didn’t expect and which, quite frankly, scares me. I fear the day that parks, which are the epitome of public space, come to mean “safe” in the way that suburban shopping malls are viewed as safe – because of their sterility and exclusion of certain social classes. 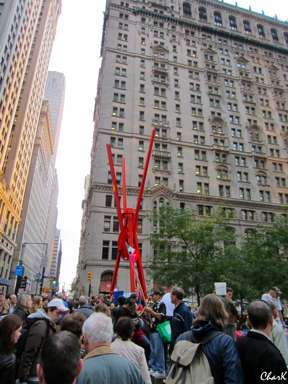 As I have not been the first nor the last to observe, The Occupy Movement seems a little shrouded in mystery as to what they are naming or claiming, but their occupations of public spaces at least speak to the importance of claiming the right to space that is safe insofar as it is truly public.